PRNewswire: ActLight, a Swiss technology startup developing Dynamic PhotoDiodes (DPDs), announces that the results of its internal tests performed on its most recent technology developments show a device sensitivity that reached the single photon level. Moreover, the tests confirmed that the sensitivity of the DPD is tunable (i.e. at 2, 3, 5 or 7 photons) with very positive impact on the dynamic range of the device. Important to note is that the brilliant results were achieved at 1.5V bias voltage and with devices manufactured using a standard CMOS 180nm technology. "It's great that today we are among a selected few innovative technologies to have a talk at the Imaging & Sensors Summit, a great opportunity to present our recent developments in the low voltage single photon sensitivity," said Serguei Okhonin, ActLight Co-Founder and CEO. "And we strongly believe that our DPDs can inspire innovation and enhance user experience in main stream applications such as smartphones and others." "In current 3D camera sensors, pixel scaling is limited due to complex analog circuits. The DPD's simple digital front-end allows decreasing pixel size below 5 um. 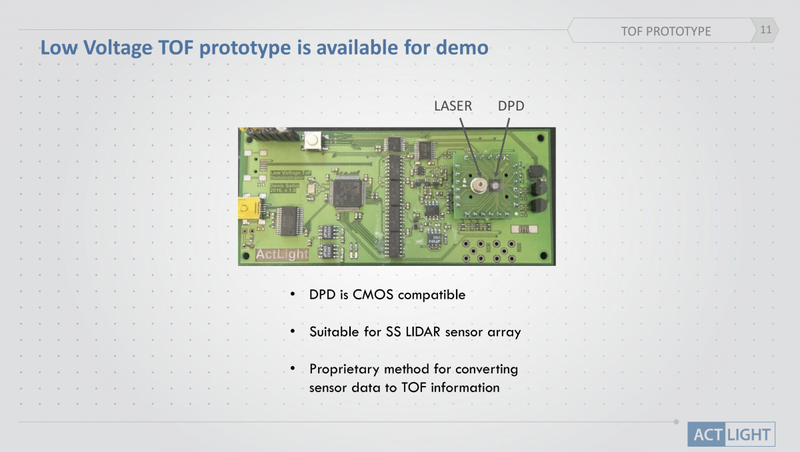 Moreover, the DPD and its read-out front-end circuit are implemented on the same substrate in standard low-cost CMOS technology and do not require high voltage for its operation." Impressive! Can't wait to see the actual single-photon data! Did they publish any scientific paper on DPD operations? I didn't find. And photon-number-resolving detection by a delay time of reverse-to-forward current switching is something, say, not obvious. Great, if it works. Surprising that a single photo-generated carrier is supposed to have significant enough impact on the charge in that DPD to have measurable impact on the switching time. Would love to see some actual science papers with some math explaining how it's supposed to work and some measurement data to back it up.